Singapore and Indonesia are neighboring countries who work closely together in many ways, particularly in developing technopreuner ecosystem. Two countries believe that technology will be producing a new generation of young entrepreneurs and helping fuel the economic growth. Held in JS Luwansa Hotel and Convenience Center, Kuningan, Jakarta in the end of February 2014, the inaugural NTU-SBM Technopreneurship Forum was attended by over 500 students from Nanyang Technological University (NTU) and School of Business and Management Institut Teknologi Bandung (SBM-ITB). Also, they were prominent speakers from Indonesia, Singapore, and reputable institutions, among them are; Chairman of NTU Board of Trustees Koh Boon Hwee, Chairman SBM-ITB Prof. Dr. Kuntoro Mangkusubroto, Minister of Tourism and Creative Economy Indonesia Dr Mari Elka Pangestu, Director UNESCO Asia- Pacifi c Prof Hubert Gijzen, Rector of ITB Akhmaloka, President of NTU Bertil Andersson and Founder & CEO MarkPlus, Inc. Hermawan Kartajaya. Koh Boon Hwee who is also the Chairman of Sunningdale Tech Ltd. opening the seminar that has a theme “Driving sustainable growth through science, innovation, and business”. In his welcoming speech, Hwee said that the forum aimed to create further awareness of powerful economic impact of technopreneurship and to encourage the growth of creativity, innovation and entrepreneurship within both Singapore and Indonesia. “Everybody needs to have an enterprising mindset in order to embrace the standard and quality of life for our people,” he added. Giving a Honour Speech in a stage, Kuntoro Mangkusubroto said ITB is well known for churning out successful entrepreneurs in Indonesia. “They succeed because they have graduated from ITB after eight to nine years studying, while some students choose to drop out.” He expressed mostly college drop-out students successfully run biggest businesses in the world. He also cited Chairman Microsoft Bill Gates as Harvard’s most successful dropout. “So, I think it would be nice if Rector of ITB Akhmaloka can produce more drop-out students.” When Marie Elka Pangestu delivered a speech, she talked about the importance of sustainable enterpreneurship. She explained that to develop the sustainable development, there are three main challenges. “They are ending poverty, increasing social inclusion, and sustainable planet. This is kind of three big parameters of sustainability,” said Mari. The seminar is getting more intense with the appearance of Hermawan Kartajaya as moderator and Indra Utoyo, Chief Information & Technology PT Telkom Indonesia Tbk. as speaker. In this convention, Indra taking “What does Telkom do to develop Indonesian technopreneur?”. According to him, a technopreneur should have at least 3 values: hi-tech, innovative and entrepreneurship. “Innovative and entrepreneurship has a meaning to make ‘creativity’ into ‘commercialization’”, he said. Focusing on building strong digital preneurship, as a largest telecommunications services company, Telkom has been continually building creative centers across Indonesia since 2011, from Sumatera to Sulawesi. The centers also provide ready-built business space and shared supporting facilities to help fasttrack the start-up of technology businesses; with business incubators, start-ups and emerging enterprises under one roof, with shared facilities and the necessary business support services. 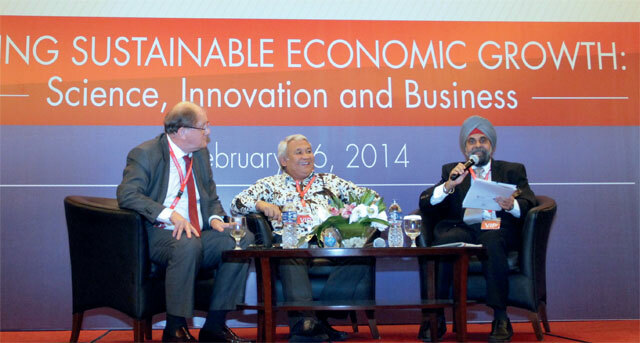 “So, young enterprises can focus on developing their business at the crucial start-up phase,” Indra said. “There will be 20 creative centers we want to build in Indonesia. Bandung Digital Valley and Yogya Digital Valley are names of few. We would like to build another one in the big J, called Jakarta Digital Valley. With 1.200 wide areas, JDV can accommodate up to 20 startup companies,” he explained. A highlight of this forum was the signing of a Memorandum of Understanding (MoU) between NTC (NTU) and SBM-ITB. Key points in the agreement include future collaborations of Students Exchange, Dual Degree programme and co-organization of academic conferences, seminars or workshops. The MoU was signed by Associate Prof Hooi Den Huan (Director, NTC) and Prof Sudarso Kaderi Wiryono (Dean of SBM) to strengthen academic cooperation between the two institutions.